Convergence technologies have fueled the demand for the integration of multiple components into unified products. 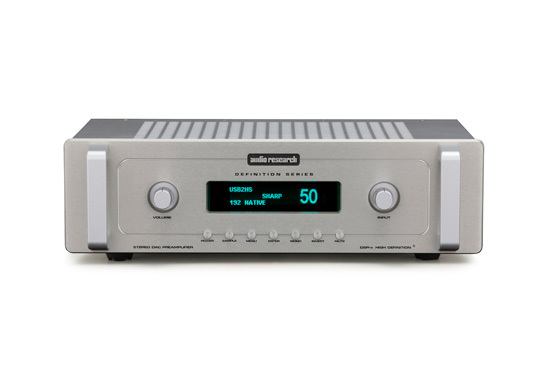 The DSPre is such a product, combining the award-winning digital-to-analog capabilities of the DAC8 into a fully balanced active analog Audio Research preamplifier. This combination of high performance and convenience in one chassis delivers incredible musical performance as well as great overall value. 500 ohms symétrique, 250 ohms asymétrique principale (2), 20K ohms charge minimum et 2000pF capacité maximum. 2V RMS 1Hz à 100kHz en 200K ohm symétrique chargé (maximum balanced output capability is 15V RMS at less than 0.5% THD at 1kHz).